APT are proud to announce that we have developed an automated and secure concentrates system as an addition to the 3tph GoldKacha concentrator, known as GoldiloxTM. The secure purge system ensures there is no access to the gold concentrates generated during the run cycle, allowing for safe storage and enabling greater control over what happens during your mine cycle. To see a video of the GoldKacha running, view our video selection here on our website, we will be uploading one for the Goldilox shortly. 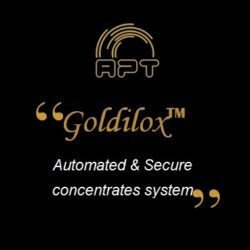 The GoldKacha operates in a similar way to Goldilox, however the difference is the safe automates and secure concentrates system as described below. All concentrates are automatically discharged at pre-set intervals into a locked concentrate box sitting beneath the GoldKacha. The security cage and concentrates box are unlocked at end of day and the concentrate box is taken to the gold room for upgrading and smelting. The run time interval is pre-set by the mine operator and is password protected for optimal mine security. GoldiloxTM also logs run time to allow owners and operators to see a record of daily use and total use. Combined with APT’s alluvial and hard rock plants, small scale miners are now able to run a secure operation on a start-up budget with the peace of mind, knowing gold recovered remains yours and is under your control. For further information, please contact us or email us on info@aptprocessing.com and we'll be happy to help. We have listed our mining equipment here on our website but we are continuously developing and do so very quickly, so if you do not see what you are looking for on our website then please do contact us and let us know what you are looking for, we may just have it in production.